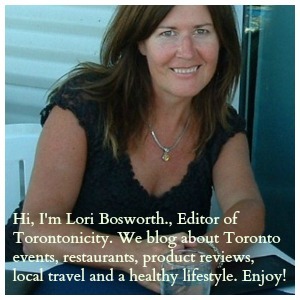 Sitting quietly on Spadina just south of King Street, Bootleg Smokehouse is serving more than just barbequed goodness! If you’ve walked past the 64 Spadina Ave restaurant, then you’ve been missing out on the delicious menu inside. 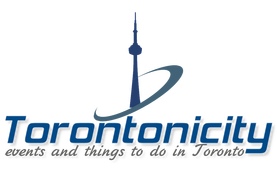 Torontonicity was recently invited to sample their delicious creations and preview their new brunch menu! 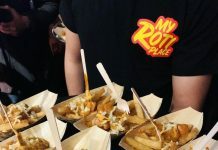 Bootleg Smokehouse opened in 2017, and probably didn’t make it to many people’s food radar because of the rise of vegan eats in Toronto. 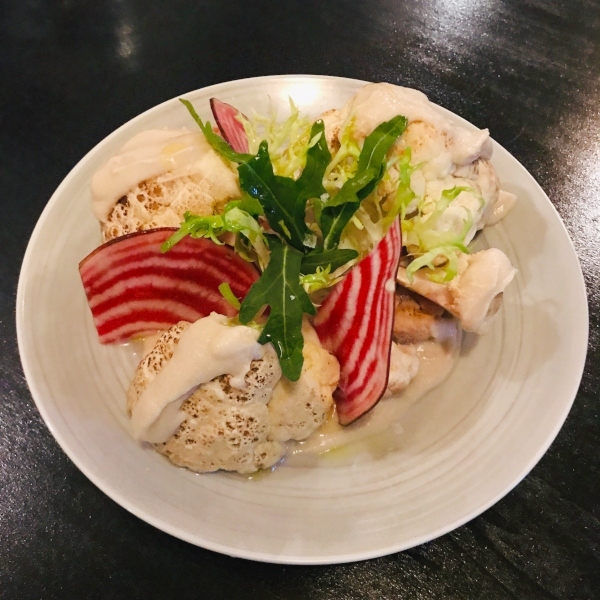 Bootleg boasts the type of menu that allows you to confidently invite your closest group of friends, even if they’re dietary restrictions range from vegan to total meatatarian though. They have an entire From the Garden section, which includes a lovely Smoked Cauliflower dish with chioggia (candy cane) beets, atop a coconut-based puree. We started our dinner with the Maple Cornbread, which was the flavour of the day; It was served with smoked butter and flaked salt. All the flavours were mild and worked so well together! The texture on the inside was soft and moist, but there was a slight crisp on the exterior from the baking. 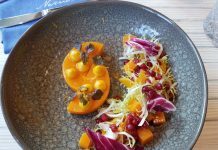 This is a menu item that’s worth checking out regularly, and ordering on more than one visit, because the base flavours are delicate and would go well with so many combinations. As soon as I saw this menu item, I immediately requested it: smoked cerignola and kalamata olives served with chilis and grated lemon rind. Wow, best side dish to enjoy with cocktails and worth ordering as a bar snack on any and every visit! If you’re looking for a perfect after work drink and small bite, make sure to order these smoked olives. The smoked note is subtle but enhances the earthy quality of the olives – so delicious! If you’re looking for a cocktail to partner with those smoked olives, I recommend the Shebeen: Leyenda Mezcal, Ardbeg 10-Year-Old whisky, angostura bitters, orange, and black peppercorn. These flavours all sound like they could clash, but they work so well together and retain a beautiful floral smokiness. I know, it sounds intense, but I assure you that this cocktail will please both mezcal lovers, as well as those who have been curious to try it. Dinner continued with the Tenderloin Tartare: smoked tenderloin, house pickles, folly mustard, jalapeno oil, and topped with an egg yolk. The folly mustard is a prominent note and is intensified by the slight bright heat of the jalapeno oil. This is a great sharing dish for a group of four or so guests, as everyone gets a couple of small bites to really enjoy the vibrant flavours. I needed something refreshing to counter all the flavours, so I went for the Tomoka cocktail: Flor de Cana 7 year rum, elderflower, jalapeno, lime, and ginger beer. Think of a dark and stormy with intensified notes, but even more delicious! It’s a bit spicier as the jalapeno plays into the heat of the ginger, but it would make a fantastic cocktail for any summer night. We then moved to the dish that I was more curious about, the Confit Tempeh: Nashville style tempeh (with sweet smoky notes), dill cornbread, house pickles, and jalapeno pesto. The strength of this dish is in the harmony of every component, despite the strong individual flavours. The sweetness of the sauce used on the tempeh contrasts with the sharpness of the pickles but is brought together by the brightness of the jalapeno pesto. The dill cornbread contributes its own sweetness, while intensifying the flavours of the herbs. I would order this dish again, and maybe request extra dill cornbread because they’re just the loveliest little bites and I enjoyed them so much – and I don’t even like dill! 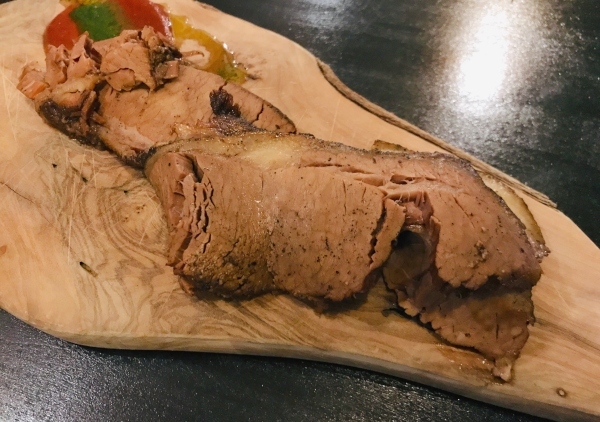 The main attraction of dinner was the Three Peppercorn Brisket, served with jalapeno chimichurri, house BBQ and pepper sauce. The brisket was so tender that it was difficult to pick up with a fork off the main plate! Every bite was moist, but still had that delicious pepper notes with subtle smoke. 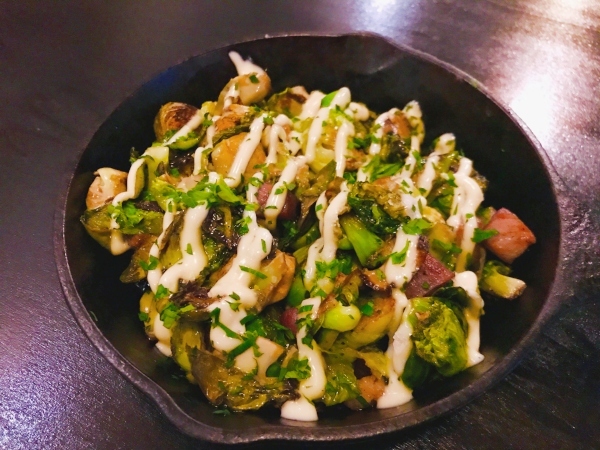 Two side dishes that would go unnoticed, but should be considered when ordering for a larger group are the blistered shishito peppers, and the roasted Brussels sprouts served with house smoked bacon, house mayo and butter. The sprouts are best for a group that wants some side vegetables that are delicious on their own, but the shishito peppers are great for anyone who enjoys some surprise heat – as one in every ten peppers is hot, and there’s no way to know which one will be the spicy one! Maybe you’re craving some delicious comfort food? 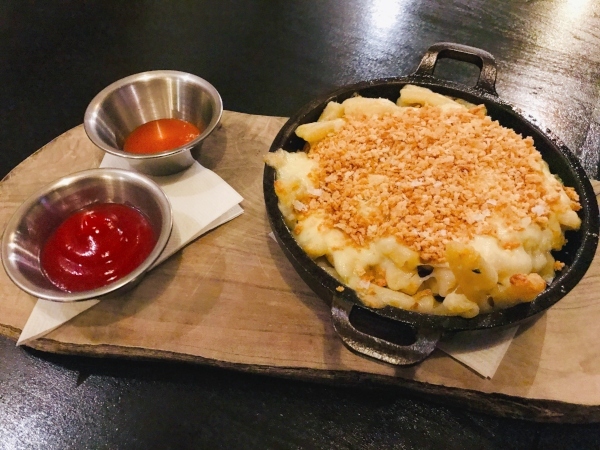 Go for the Mac + Cheese! It’s loaded with cheese, and crispy on the top with a mild black pepper spice note. Classic delicious comfort food! The mood at Bootleg Smokehouse makes it a great date night restaurant, as the music was fantastic and not too loud (though I might be biased, as they were playing My Morning Jacket’s Wordless Chorus at one point), and the lights are dimmed for soft mood lighting. 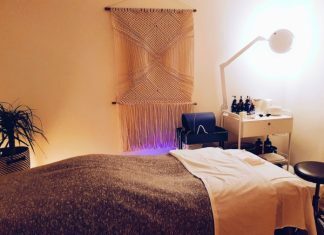 I would argue, though, that Bootleg is an ideal group or family dinner choice: the menu meets a variety of dietary restrictions, it’s extensive enough that you’ll want to order multiple dishes, and the portions are generous. Bootleg is also right at the corner of King and Spadina making it a great choice for pre or post-game eats during the Jays playing season! Another great reason to visit Bootleg Smokehouse with a larger group is their new brunch menu. 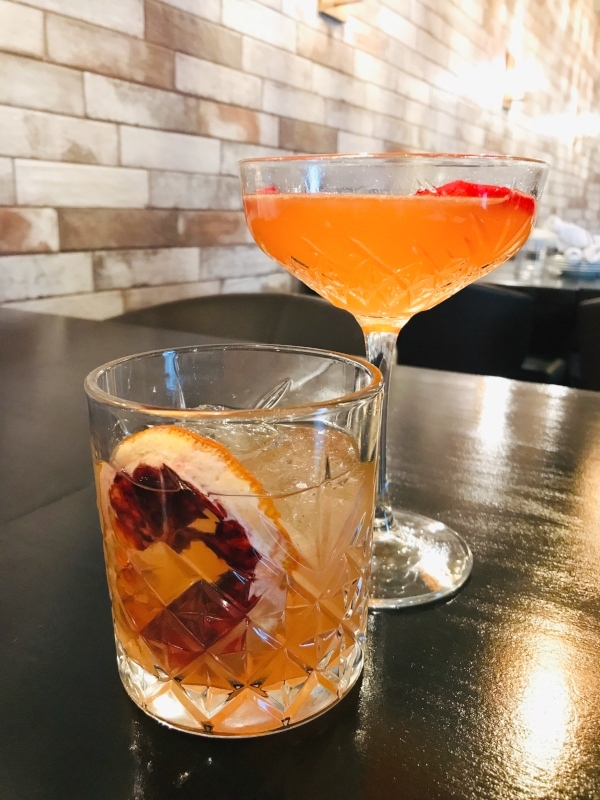 They officially launched weekend brunch in April, and offer items such as the Bootleg Benedict, smoked berry French toast, smoked avocado toast, and cornbread pancakes served with bourbon maple syrup. 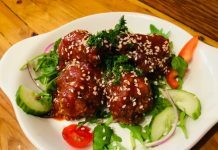 With all the amazing gluten free, vegan, and just plain delicious menu options, Bootleg Smokehouse is currently one of Toronto’s hidden gems. Book a table for your next family or group meal, and enjoy every great bite! The food and drinks look so good! I mean if I lived near by I would try it!